I'm currently expending my cognitive surplus with the help of the critical technology of the industrial revolution. "Where do people find the time?" That was her question. And I just kind of snapped. And I said, "No one who works in TV gets to ask that question. You know where the time comes from. It comes from the cognitive surplus you've been masking for 50 years." And of course, I agree. I spend a lot of time talking to people about the shift from passive to active consumers. Active consumers are different. If they aren't involved, they are interested. It's the same challenge that people tend to make when thinking about immersive brand experiences, transmedia ideas or ARGs or anything complex that requires a lot from the people we hope to influence. And that's the point - if there aren't the gaps, if there aren't things for them to do, they aren't interested. Of course there are levels of involvement, not every rabbit hole needs to go all the way to Wonderland. But everything should have gaps for people to fit into. [Russell used to call this leaving room for the mouse in the mousetrap - good advertising has always asked the reader to fill something in. Actually, let's go back - all good idea transmission requires this. Duchamp and Barthes both understood this - the act of creation is only completed inside someone's head. And I'm willing to raise that to a general principle. It's better to do something than to do nothing. Even lolcats, even cute pictures of kittens made even cuter with the addition of cute captions, hold out an invitation to participation. And I wondered if I was wasting my time, sitting doing nothing, staring at the sea. It's better to do nothing, than not to do anything. A campaign for Shreddies in Canada introduces the new diamond variant to consumers in real focus groups held in Toronto. It's pretty funny - especially if you've ever done any qualitative research - and is another example of what J Vulkan dubbed User Involved Content while we were going through the Clio entries. There has been a groundswell of real people captured on camera in ads - reality advertising if you like - abandoning high production values for the gritty authenticity of gonzo film making. The Whopper Freakout works on a similar principle - hidden cameras capturing genuine people being deprived of their Whopper - as does the new Pizza Hut ad, where restaurant patrons are served Pizza Hut pasta.They claim to like it even more once they are told it was deliverd by Pizza Hut. And, in the film above, one of the subjects expresses a taste preference for the diamond shape Shreddies. Silly - it's the same! Except: what if it's not? I'm going to be moving around for a while. I'm heading down to the Clio Awards in Miami tomorrow - I'm helping to explain our decisions in the Content and Contact category on Saturday morning. And then I'm heading down to Brazil to speak at the Wave Festival in Rio - about being beta and the internet and brands and that. Do come say hi if you'll be at either. After that I'm going to be on holiday for a bit - so TIGS might be quiet for a couple of weeks. 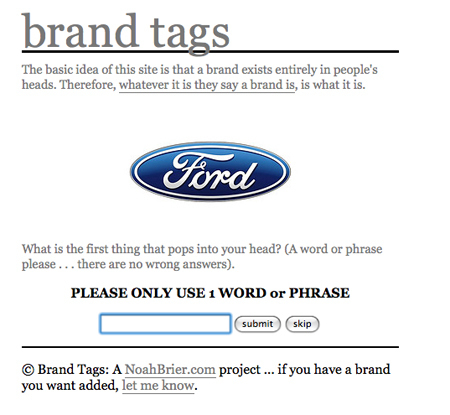 Noah has just created Brand Tags - a site that allows you to tag brands with whatever words you associate with the brand and then converts the brand into a weighted tag cloud of associations. It nicely demonstrates the socially constructed nature of brands and their inherent multiplicity of meaning - putting the one word equity idea firmly to rest. Campaign Magazine asked Richard, Scamp, Ben, Neil, and I to have a big blog up to blog about blogging. They wanted to know why we do it, among other things. O blogging how do I love thee - let me count the ways. I blog because it makes me think. The blog needs constant feeding, so I need to keep thinking and reading and making things up. I'm constantly looking to make connections between disparate things, to package them up into posts. Finding patterns. Or creating them. It's a place where I can think unfettered and get feedback on what comes out, from people who I know are interested in the same sorts of things, otherwise they wouldn't bother. It's writing but it's not solitary. It's a place where I can do whatever I want with words. You can see the rest of the rambling here. A couple of days back I met up with the lovely people behind Behance. Behance are designing products and services that "empower the creative world to make ideas happen" because of the observation that most ideas vanish, stillborn, into the ether. This creative waste is a shame for everyone, so Behance want to help ideas get actualised. One of the tools they use is what they call the action method - an insistence that every creative session leads to action items - and to help bring them to life they created action books - notebooks that are designed to craft notes into actions - as shown above. You can buy the well made note books and other action items via a website - but the point of them is not to make money, but to market Behance, it's creative networks and consultancy services by spreading the philosophy behind it in a useful way. Marketing that people pay for. My mate Rob works for Nooka - a design brand started by Matthew Waldman, looking to invent products that challenge the paradigm they operate in. The first product is a a line of cool watches that re-invent how to display the time. As all brands that have a unique view of the world should, they have a blog where they update the faithful on Nooka news and celebrity sightings. 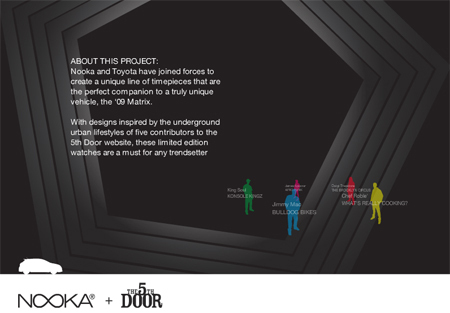 They've just announced a collaboration with Toyota - Nooka designs, inspired by participants of the Toyota 5th Door program, to celebrate the new Toyota Matrix. The watches are limited editions and being sold for $300 a [time] piece. I've been thinking about marketing people will pay for for a while now. It started with BK Games - I think perhaps the most interesting thing about these globally lauded Burger King XboX games is the fact that people paid $3.99 for a piece of advertising. 3.2 Million people, according to the case study. It's difficult to fault marketing that actually makes money, in and of itself. Staples turned their Easy Button into a product and sold millions of them, donating a proportion of proceeds to charity, but this was more of a happy accident, one assumes. Whereas, things like the IDEO Method Deck are more strategic. 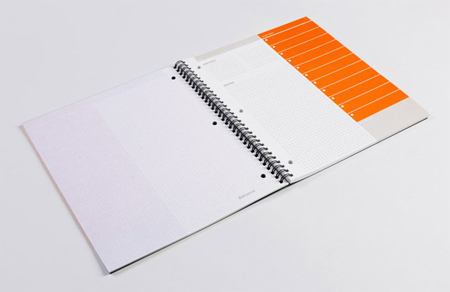 The cards detail 51 methods that IDEO use to help inspire great design. So - they are a product. 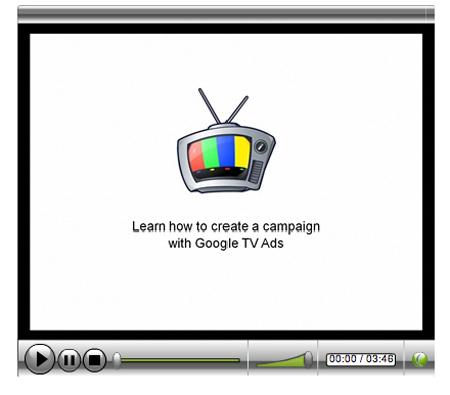 But they are also a powerful piece of marketing - positioning IDEO as the people to call when you need some design help. IDEO have just launced their Field Guides for the Curious - travel guides that shun the obvious for the unknown, which positions them as experts on urban design as well. but when people are willing to pay for your marketing, even if it's only a nominal amount, it follows that the marketing has value and is desirable. And that seems like a good thing.